Type cmd and press the Enter key. with a cursor blinking next to the “>” symbol. where [hostname] is the name of the server connection you are testing. See the section “Determining [hostname]” below for help with the hostname. You may have to wait up to a minute or more for the test to complete. It will generate a list of the connections along the way and some information about the speed of the steps along the way. Send us the complete results (every line) for analysis. Right-click the window and Select All, then hit Enter on your keyboard. You can paste it now into a document. This writes the command results to a text file named trace1.txt in the root of your C: drive. You can then open this file and paste the contents into your email message to Support. If you have OS X, you can use the built-in network tools. Double-click the Hard Drive icon and navigate to Applications > Utilities. 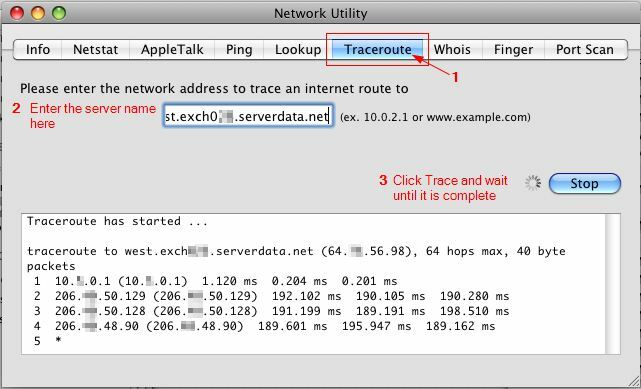 Click the Traceroute tab and enter the hostname.